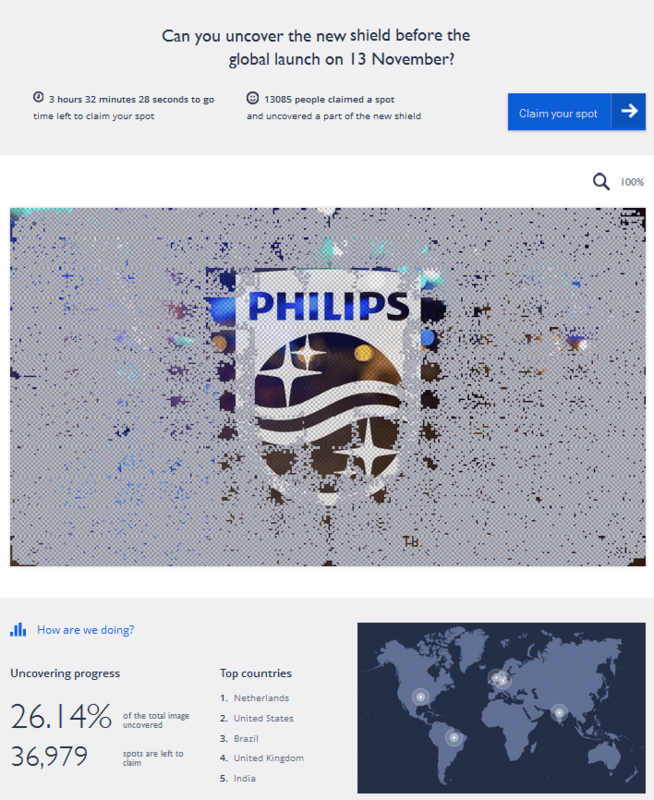 Monday morning someone in my network tweeted a link to a site called “#UncoverPhilips“. A promotion by the large multinational we all know quite well to get some social buzz around their new logo that they are announcing today (Nov 13th 2013). The site was quite simple and showed a gray image hiding the new logo. 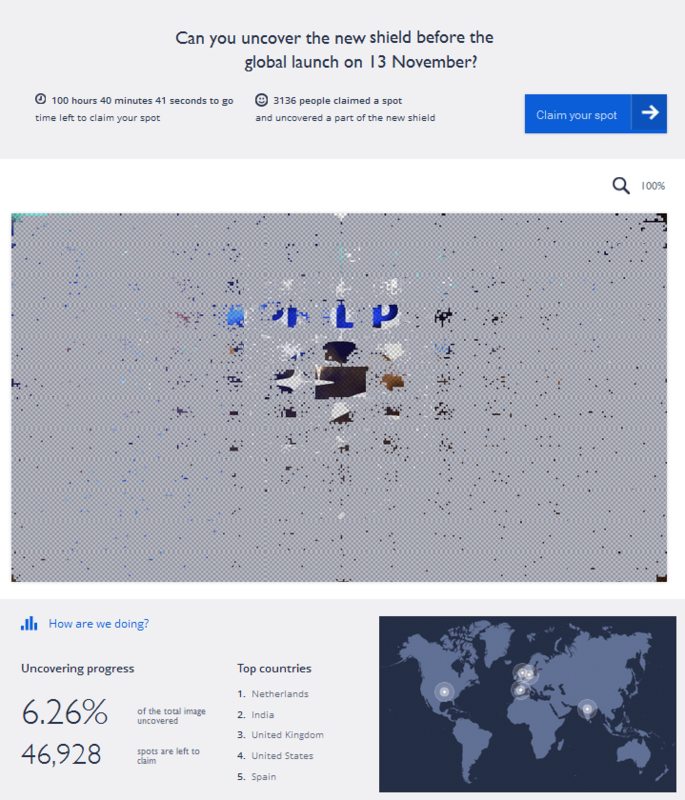 Users could uncover a pixel of the image and so uncover the logo before it’s actual launch. Catch: you had to do so by signing in with your Twitter or Facebook account, effectively allowing them to access your data and post on your behalf. Ok, not too bad. so why do they want me to sign in then? Yeah and that’s where it gets interesting to me as there seems to be no added value in it for me, other then to be able to uncover 1 pixel of a 50.000 pixel image. There is no prizes to be won, no secrets to be gained other then a 1/50.000th sneak peak of a logo they are uncovering anyway… And that is what intrigues me! Apparently someone thought enough people would be motivated to participate solely for that so I couldn’t help but follow how this would evolve. Now ok, does this mean it is a success or not? I’m no Marketing expert but three hours before the deadline only 26% of the picture is uncovered… You might call that a failure but I have no clue what their goal was…. 13000+ people have done it. Let’s say that on average everyone of those has about 100-500 followers on Facebook and that an average post on Facebook reaches about 1/3 of your followers. Also factor in the multitude of people that visited the site based on tweets, links and posts who opted (like me) not to participate but have in the process learned about the new logo… That’s still an impressive reach without having to pay for it (other then to create this site). I can’t help wonder though what the difference would have been had there been any prizes involved… Would the number of people participating be higher? Did the fact that apart from the curiosity factor there was no real incentive and the fact that most of the actual logo is concentrated in the center of the area (which was uncovered first) influence the results? Sometimes Marketing can be really intriguing!